The Infiniti Q70 strikes its own chord, rivaling the world’s best luxury sedans in presentation without copying them–it’s a true original in styling and design. Striking, voluptuous curves and complex surfaces wrap an interior filled with warm wood, semi-aniline leather, and considerably more personality than you’ll find in comparably stark European alternatives. While 2015 marks a series of cosmetic changes inside and out, only the most eagle-eyed enthusiasts are going to be able to spot some of them.The new headlight design and redesigned “double arch” grille are the most evident (with a new three-dimensional look to the waved metal mesh), while the front bumper has been reworked and there are new-design foglamps, a flattened trunklid, and new LED rear lamps (plus a new chrome bar). Tint Magic Window Tinting has applied on Infiniti Q70: Carbon Film 35%all over the windows for the best clarity and protection against sun heat and UV . Call us for a free quote! (954) 840-7883. We are located at 11344 Wiles Road Coral Springs. 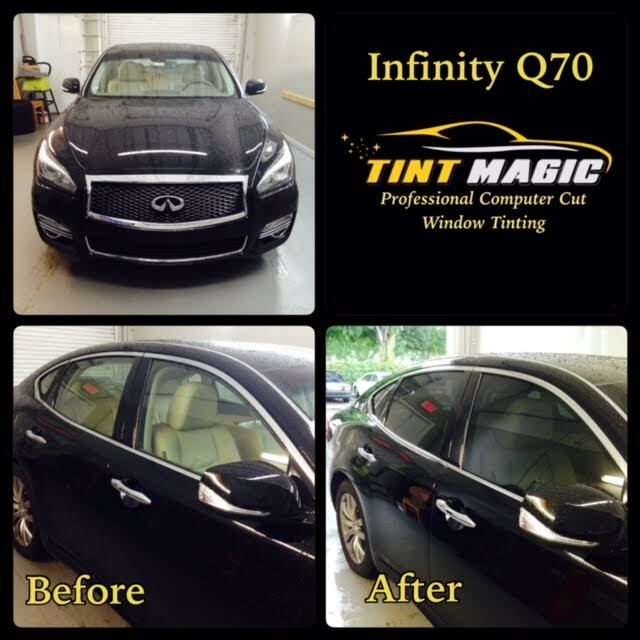 Tint Magic Window Tinting serving Coral Springs, Parkland, Tamarac, Coconut Creek, Sunrise, Weston and Margate.